A big thanks to Hachette Children's Group and NetGalley for providing me with a digital copy of this book for review. Little did I know until I picked up Girlhood three days ago, that my heart was yearning to read a boarding school book. Having loved Mallory Towers when I was younger and secretly wishing I could go there (as I think everyone who read it did! ), a book set in a grand old boarding school in Scotland was the perfect fit for me straight away! Girlhood follows the life of Harper who lost her twin sister to a battle with anorexia, as she struggles with the grief of moving through life without the person who she thought would be by her side for everything. It's a heartbreaking read in that sense because it's something that really does affect a lot of people and doesn't get a great deal of attention in the sensitive way that it should, this book looks at it as well as any book can, in my opinion. A new girl comes to the school, called Kirsty, she and Harper seem to share a lot of similarities as the discussing having both lost siblings and how they are dealing with grief. Throughout the book it becomes apparent that there is a lot more to Kirsty's story than she's saying and as things gradually come to light (to the reader if not to Harper!) a great sense of mystery arises which meant I was absolutely whizzing through the pages, I needed to know what had happened! The other thing that I loved about Girlhood is that it features a bisexual main character who is written super duper well and who's validity isn't questioned other than occasionally by other girls who don't quite understand yet (as is the way in real life). There is also a lesbian character too and the bi girl and the gay girl aren't a couple because they're the only non-hetero main characters, they're friends and it's so refreshing to see. Overall, Girlhood is a brilliantly quick read which deals with a lot of difficult issues in a way that's respectful. Without spilling a lot of spoilers, it demonstrates the value of friendship and the importance of showing kindness towards people even though they may not wholly deserve it. 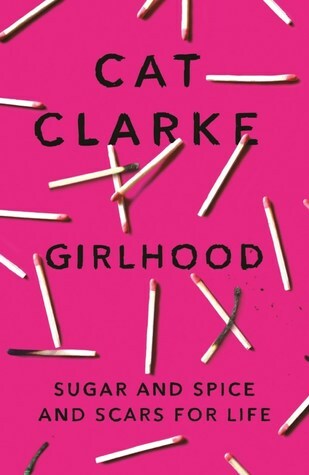 Grief is a horrible thing and certainly a tricky subject to write about but Cat Clarke manages to represent both the differences and similarities between two characters' experiences in a way that is both intense and truthful. I truly enjoyed every page and I'd really recommend that everyone gives it a go. Let me know what you thought of Girlhood, or recommend me any similar books which come to mind in the comments below. Whoa. Thanks so much for this review, I definitely want to read this now!